This Easy Creamy Lemon Broccoli Pasta recipe can be ready in 25 minutes, or less! 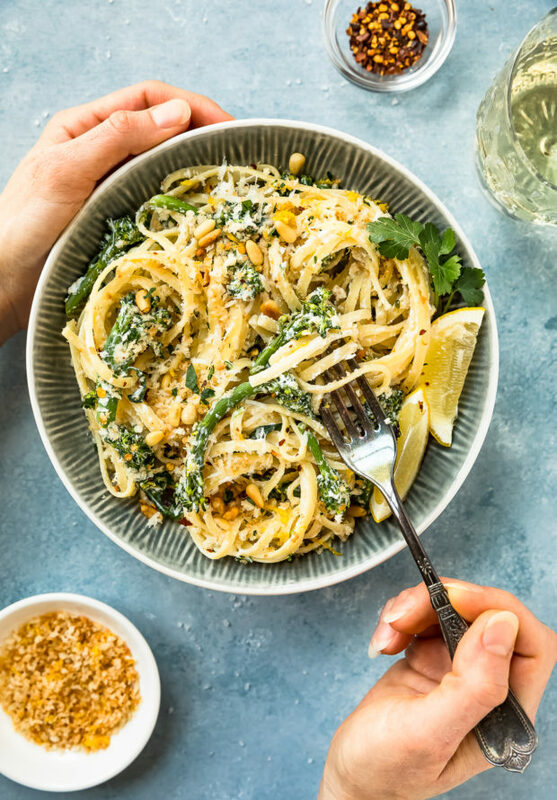 Made with rich ricotta and finished with crispy lemon breadcrumbs, this flavorful and fast pasta is a weeknight dinner winner! This post was originally published in June 2018. I’ve updated the post below to include more information about this broccoli pasta. Plus, I added a recipe video to show you how easy this creamy ricotta linguine is to make! And just like that we are 6 days unofficially into the summer season. While I definitely am craving all the juicy, ripe fruits, fresh salads and ice cream on repeat, I’m also only human. So naturally, I am still yearning for big ‘ole bowls of pasta on the regular. And, because oodles of noodles are life, that is exactly what I’m sharing today. 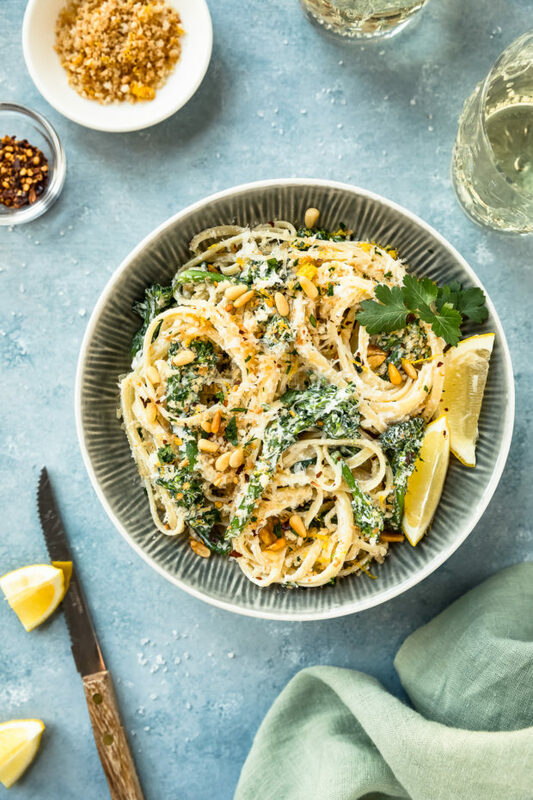 Heaps of al dente noodles coated in a rich and creamy, yet light ricotta sauce, tossed with tender broccolini (or broccoli) and earthy, fresh parsley. 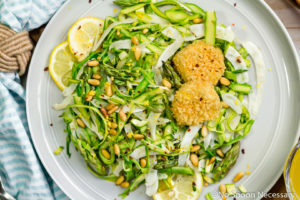 Finished with a generous sprinkle of crispy, tart lemon breadcrumbs and crunchy, salty pinenuts this easy broccoli pasta is jam packed with both flavor and texture. These creamy noodles are super satisfying, yet lightened up. 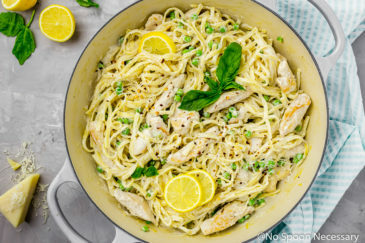 Essentially, this lemon pasta is a healthier and easier take on Alfredo with some spring/summer vibes thrown in for good measure. What to add to broccoli pasta? 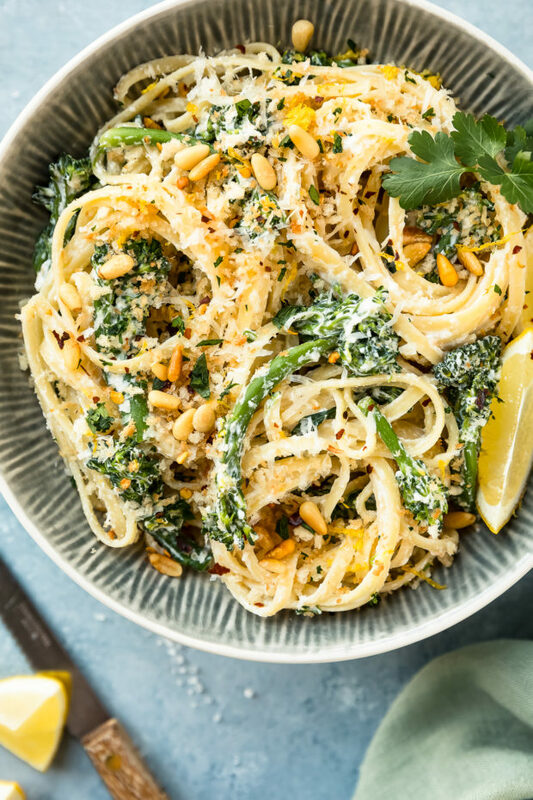 This creamy pasta is loaded with ricotta, broccoli, pine nuts and crispy lemon breadcrumbs, however there are a ton of ingredients you could add! What to serve with broccoli pasta? 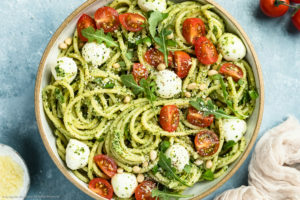 While this pasta recipe is hearty can be consumed as a complete vegetarian meal, there are plenty of side dishes you can serve to round out your meal! Since this broccoli pasta is creamy, make sure you pick a lighter side to cut through and complement the pasta! Both broccoli and broccolini are closely related to cabbage, and while broccolini might simply look like baby broccoli, it is not. 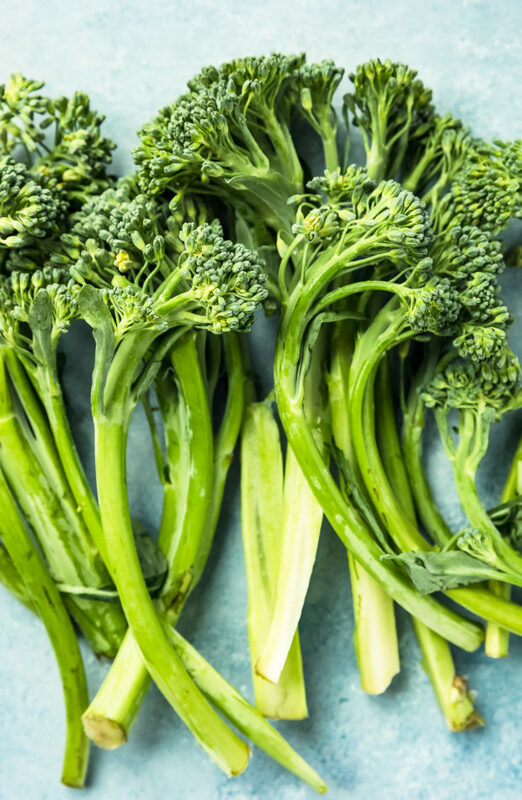 Broccoli, with its thick stalks and rounded florets has a grassy, earthy flavor that is mildly bitter. Broccolini, on the other hand, is a cross between broccoli and Chinese broccoli. This hybrid has longer stalks, smaller florets, and compared to broccoli, broccolini has a milder and sweeter earthy flavor. Can broccoli and broccolini be used interchangeably in pasta? 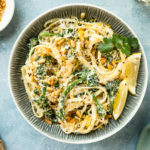 In this recipe for creamy lemon broccoli pasta, yes, you can absolutely use broccoli or broccolini! 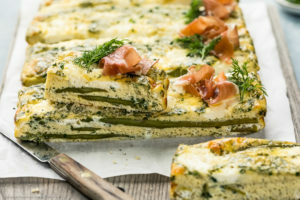 While the recipe below does stipulate broccolini in the recipe ingredients, you can use broccoli if you prefer to keep things on the ‘safer’ side, or if you simply don’t have access to broccolini. You can use any type of pasta: While I used linguine in this recipe, you can use any type of pasta you prefer! Just make sure you cook the pasta to al dente according to directions on the package. Do not overcook your pasta! You can use any type of dried breadcrumbs you would like in the recipe below. I used panko breadcrumbs because I like their texture and size best. Make sure you use a good-quality, whole milk ricotta cheese! Since the ricotta cheese mixed with some of the reserved pasta water is what makes the sauce, do not skimp on the quality of the ricotta cheese. Add pasta water to make the sauce: While you should always make a recipe your own, and I encourage you to add as little, or enough pasta water to create a sauce as thick, or thin, as you prefer. With that said, in case you need an approximation, I used about 1/3 cup of reserved pasta water. Add a little heat: While the crushed red pepper flakes are listed as an option, I highly recommend adding at least a pinch! The heat from the pepper flakes cuts through the creaminess of the pasta and adds a little something special! Quick and easy to prepare, yet creamy, dreamy and full of fresh flavor, this creamy broccoli pasta is sure to be a weeknight dinner winner! Until next time, friends, cheers – to oodles of lemony noodles! This quick and easy Creamy Lemon Broccoli Pasta can be ready in 25 minutes, or less! Al dente pasta tossed with broccoli and an easy sauce made with ricotta cheese, then finished with crispy lemon breadcrumbs. This easy pasta is a weeknight dinner winner! Make ricotta mixture: In a small bowl, mix the ricotta with the lemon juice, 1/4 teaspoon salt, 1/8 teaspoon black pepper and a pinch of crushed red pepper flakes (optional). Set aside. Bring a large pot of salted water to a boil. Boil the pasta to al dente according to package directions. During the last 3-4 minutes of cooking*, remove and reserve 1 cup of the pasta cooking water and then add the broccoli to the water. While the pasta is cooking: Heat 1 tablespoon of the oil in a large, straight-sided skillet over medium to medium-heat. Add in the breadcrumbs and season with salt and pepper. Cook, stirring often, until the breadcrumbs are golden brown. Transfer to a small bowl and add in the lemon zest and parsley. Mix well and set aside. Drain the pasta and broccoli and return both right back to the pot. Set the pot over low heat. Add the ricotta mixture and enough of the pasta water to create a sauce*. Add the breadcrumbs and toss throughout. To serve: Divide the pasta among serving plates. 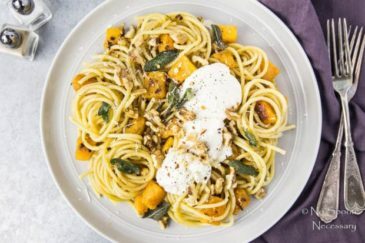 Top with pine nuts and parmesan. Serve with lemon wedges. Enjoy! 1. 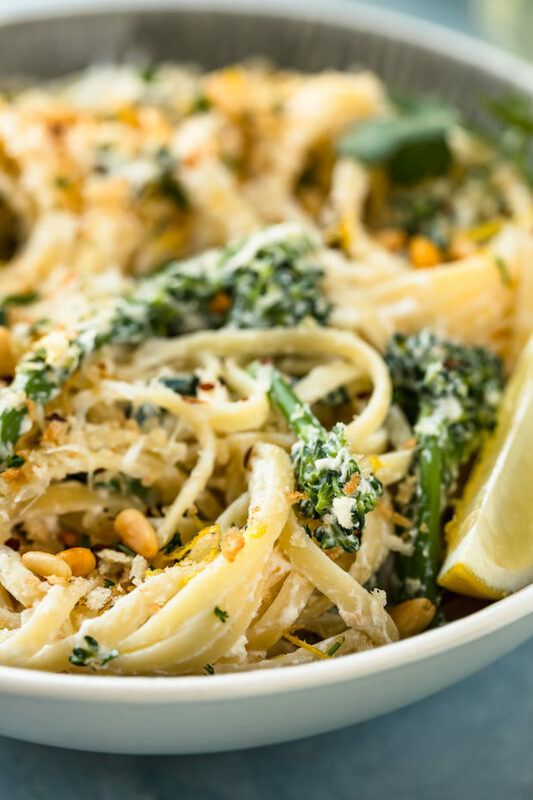 While I used linguine in this recipe, you can use any type of pasta you prefer! Just make sure you cook the pasta to al dente according to directions on the package. Do not overcook your pasta! I like my broccoli tender-crisp. If you want really tender broccoli, add the broccoli to the pasta earlier. While you should always make a recipe your own, and I encourage you to add as little, or enough pasta water to create a sauce as thick, or thin, as you prefer. With that said, in case you need an approximation, I used about 1/3 cup of reserved pasta water. While the crushed red pepper flakes are listed as an option, I highly recommend adding at least a pinch! The heat from the pepper flakes cuts through the creaminess of the pasta and adds a little something special! Chey, I love all the flavors and textures in this pasta! It looks incredible! And the creamy lemon sauce sounds so delicious! Cheyanne, your updated photos are stunning! 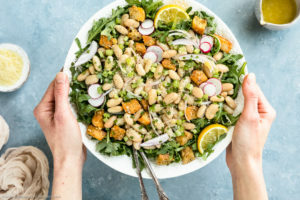 This sounds like such an easy yet flavor jammed meal – this is going on our meal plan for next week – thanks lovely! Love the video Chey! I want to grab a bowl right through my screen! Dee-lish! I will never have enough broccoli (or enough pasta) in my life! This looks SO GOOD, Chey! Have a great week, girlie! So the broccolini in this pasta are fresh? You don’t cook them at all? You cook the broccolini (or broccoli) in the first step of the recipe with the pasta. Tried this tonight for dinner! Skipped the broccoli, nuts and bread crumbs but added some garlic sautéed spinach. It turned out so good! It was very flavourful and satisfying. Would definitely make again and again. Garlic sautéed spinach sounds like a wonderful substitution! I’m thrilled you enjoyed the pasta! Thank you so much for coming back and letting me know how it went over! Cheers!! I love quick and easy pasta recipes! Yum! Chey, as long as you continue posting some fabulous pasta ideas, I’m going to visit your blog! 🙂 Here we go again. I’m so in love with the combo of broccoli, ricotta, lemon, and herbs. Also, please continue sharing pasta ideas during the summer season. After all, along with salads and ice cream, light versions of pasta (like this one) is a perfectly summer dish! When it gets warm I still crave pasta, so I’m loving this dish with these fresh flavors! This looks delicious and I can’t wait to try it! Putting this on our weeknight menu! We love simple and flavorful pasta dishes like this year-round! And this one may be easy, but it’s pretty enough for company. Can not wait to try it! Thanks, lovely! I officially love this pasta. Broccoli is one of my obsessions so I’m always looking for new ways to eat it. And only 25 minutes to this gorgeousness? I’m in, girl! Have a great weekend, Chey! Total winner of a light pasta dish for summer Chey! 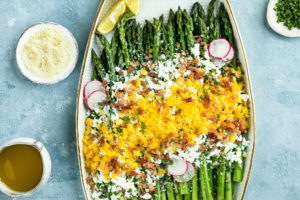 Love the addition of the broccolini and those lemony breadcrumbs on top sound perfect! 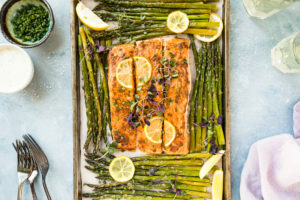 I’ll definitely be adding this recipe to my summer dinner menu! The boss will love this one too! 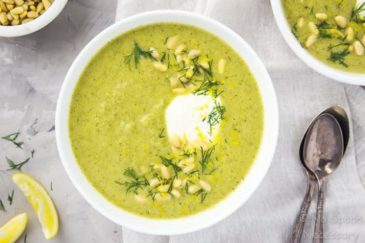 Simple yet so delicious and healthy! You make simple pasta dishes so inviting and moreish, Chey.